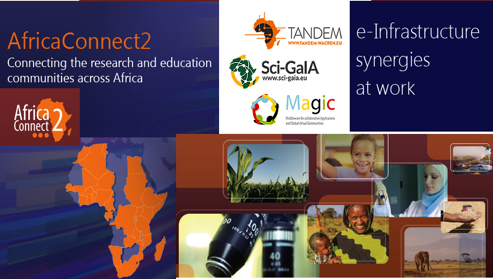 AfricaConnect2 (2015 - 2018) - a successor of the AfricaConnect (2011-2015) – is a research and education networking project which aims at connecting the participating national research and education network partners across and beyond (through the pan-European GÉANT network) Africa. ​​​"The AfricaConnect2 project comes at a time when the demand for adequate bandwidth and network services from researchers, lecturers and students at West and Central African higher education and research institutions is extremely high” (Testimonials: Boubakar Barry – CEO, WACREN). The overall objective of AfricaConnect2 (AC2) - an EU-funded pan-African connectivity project – is to contribute to the reduction of poverty, brain drain and digital divide by unlocking​ the strategic role of ''virtual'' infrastructures enabled by Information and Communications Technologies (ICT) for sustainable development in Africa through improved access to education and research resources​. develop​ connections to the pan-European network GÉANT (and related e-infrastructure services for the benefit of research and education) offering a gateway for global R&E collaborations. [GÉANT manages R&E networking projects serving Europe, the Mediterranean, Africa, Central Asia and the Eastern Partnership countries. In addition, it supports R&E networking organizations in Latin America, the Caribbean and Asia-Pacific and coordinates Europe-China collaboration]. To improve regional, intra-regional and international connectivity, AC2 adopts a modular approach adjusted to the geographical ("Clusters"), cultural and organizational context of the African regions and their different stages of National Research and Education Networks (NRENs) development, as well as their sources of funding and long-term prospects. South and South Eastern Africa (Cluster 1) are served by a sister project contracted between the UbuntuNet Alliance and the European Commission (EC). Between 2004 and 2015 the North African countries participated in the EU-funded EUMEDCONNECT project which provided high-capacity connectivity and interconnection to the GÉANT network for the R&E communities across the southern shore of the Mediterranean. AC2 also builds on the achievements of the EUMEDCONNECT project which continues to serve the countries in the eastern Mediterranean (Jordan, Lebanon and Palestine). 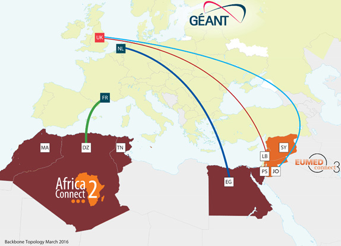 In February 2016, GÉANT and ASREN upgraded international connectivity available to Algeria’s scientists, academics and students from 622Mbps to 2.5Gbps. This capacity enhancement clearly refle​​​​cts the long-term commitment to facilitating collaborations between Algeria’s NREN - ARN (supported by CERIST: Research Centre on Scientific and Technical Information) and the global R&E community. Within AC2 and in conjunction with ASREN and European partners, ARN’s focus is now on providing value-added services on top of connectivity such as eduroam and eduGAIN. Through its interconnection to the pan-European GÉANT network, ARN enables Algeria’s researchers, academics and students to participate in world-class international research and educational activities in areas such as high-energy physics and earth observation focused on high-resolution regional gravity field modeling, combining images from GOCE and GRACE satellites with terrestrial data. increasing responsibility and own​ership of local actors within the R&E networking communities ​on their path towards sustainability. NUANCE - the monthly e-newsletter published by UbuntuNet Alliance (in English and French) covering news from, about, or of interest to National Research and Education Networks (NRENs) in Africa.